Imagine all of your forms online, including Applications, Tuition, Donations, Registrations, Event Sign Ups, T-shirt orders. We can build the forms for you or you can use our super easy form building tool. Your parents have been asking for it...now you can deliver it. Complete with connections to 4 popular payment gateways, our Form Builder can accept payments and donations. Parents and students can now sign up for events, fill out applications, and make payments all from the convenience of their home or anywhere with an internet connection. The forms integrate easily with our websites and mobile apps. Easily create sign up forms for events. Collect payments for events or other activities right in the form. 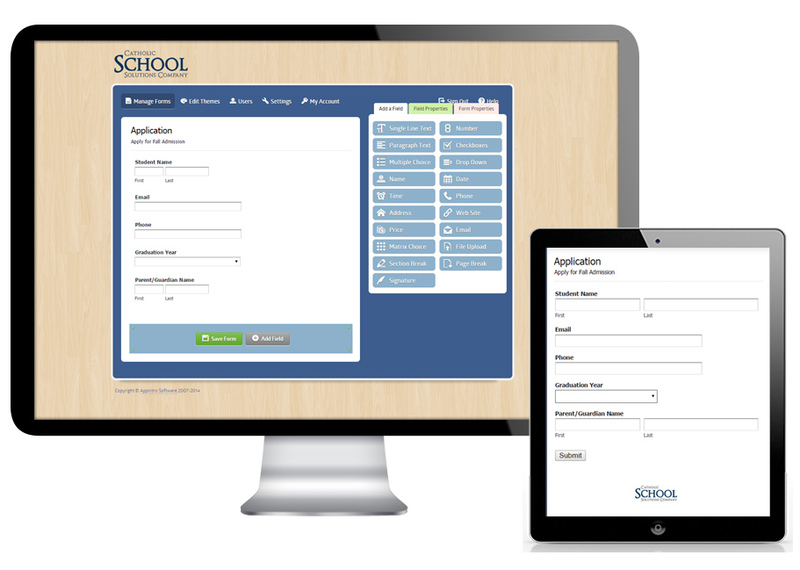 Create the easiest and fastest donation system available for Catholic Schools today. Donors simply enter their name, credit card info, and email address. No physical address. No usernames and passwords. No logging in. No clicking multiple times on multiple pages. No hidden or confusing buttons. No unnecessary information required. Our forms make donations a breeze. Recurring donations are also available. Create surveys and polls and view data in pie charts, graphs, and spreadsheets. That is correct. Create as many forms as you like and put as many fields on the forms as you want. Receive form submissions direct to your email. Form submissions are also available for download as an Excel file, .CSV, or .TXT. You can also view submission data as a pie chart, donut chart, bar chart, line chart, area chart, or grid. Want to move even your largest forms online? No problem. You can create multi-page forms. Multi-page forms can be saved and revisited by users. The user's progress is also displayed on the top of the form. Forms are hosted on our secure servers. No need to worry about security. Grab the code to embed the form on your website, mobile app, Facebook page, Blog, or other social media site. Or, you can simply link to the form via an email or website. Links and code are generated for you automatically. Simply copy and paste. The program automatically sends a notification email to the email address of your choosing. You can also send an auto confirmation email to the person who completed the form. Specify the sender and reply to address of the emails for an even more personal touch. Hide and Show form elements based on user input. For example, if the user says she has "3" children for Sunday School, then you can tell the form to show three name fields for the children. Or, if the user decides to pay in person, you can skip the online payment part of the form. As you might expect from the company that brought you the Parish Mobile App, our Parish Forms are all mobile friendly. Open them up on your phone or tablet and they look and work great. We offer easy integration with five major payment gateways. We can advise you which is the best for you and help you set it up. You may already have one setup. Two of the options have no monthly or setup fees! Not sure how to do something? Give us a call or email. We are here to help. Easily copy all the registrants' email addresses into your email program, thank them for attending, and invite them to the next event. Instead of sorting through an old stack of illegible papers, just peek at last year's excel file to see who and how many signed up. Send them an email again. Creating surveys and polls is a great way to quickly gather data and input. Create a Parish Survey or Poll and instantly see broad trends on pie charts and graphs. You don't have to sift through piles of papers to quickly see that your community prefers option 3 standing out on a bar graph when it comes to Mass times or whatever question you asked. The ministry of hospitality often begins with the event registration or sign up process. If the sign up processes is not available and easy, those "invited" start to feel not so invited. If it feels like you have to know someone or know a secret to sign up for a School event, then there is a failure in hospitality. Time is money. Even among staff and volunteers, time translates into money. Free your staff and volunteers from unnecessary paperwork. Or, if you currently rely on a technical person to create forms for you, save the money you are spending and easily create them yourself. With the ability to temporarily disable forms, you can put save them until you need them next year or next month. Eventually you'll barely be doing anything.